This low calorie soup gives you only 36 calories and meets ¾th of your daily vitamin A requirement. It is hence the ultimate choice of soup for weight watchers. • Heat 1 tsp of oil in a pressure cooker; add sliced onion and sauté on a medium flame until they turn translucent. 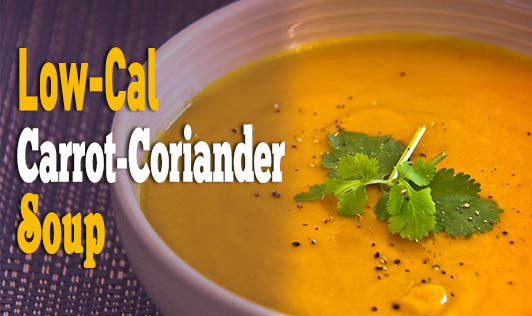 • Add the carrot cubes, ½ cup of coriander, and sauté on a medium flame for another few minutes. • Now add 4 cups of hot water, salt to taste, stir well, and pressure cook on high flame for 2 whistles. • Cool the pressure cooker and allow the steam to escape. • When the mixture is slightly cool, blend it in a mixer until smooth. • Transfer the blended mixture in a deep nonstick pan and bring it to boil. • Add the pepper powder, ½ cup of coriander, and mix well. Garnish with carrot strips and serve immediately.